The winter chinook salmon are back in local waters and the fishing is pretty good. 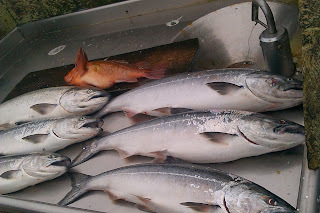 Paul from Salty Charters posted this photo of a fun morning ... biggest to 15 pounds. These salmon are fun to fish, right on the bottom and with pretty much any gear ... there's a reason they call them "feeders", they are hungry. Most common is glow hootchies. When you get into a good school, it is fun to fish with a spoon and no flasher, with lighter rods.....get a nice fight out of it. Keep in mind Sooke's Boxing Day Derby. Perfect way to spend the day after Christmas! The derby is run from Jock's Dock, $30 a ticket, with one third of funds raised going to the Sooke Food Bank and the rest for prizes. You can pick up a ticket at Eagle Eye or Jock's Dock.